Othello is a combination of greatness and weakness. Certain obstacles cause him to fall from grace, most especially the fact that he is an outsider to Venetian society. A well respected general in the Venetian defence forces. Although a foreigner from Africa, he has won this post by excellence in the field of war. He is courageous, intelligent, skillful in command, and has the respect of his troops. Under pressure, he makes an inspiring speech. The Venetian government trusts Othello enough to put him in full martial and political command of Cyprus when threatened by the Turks. Senator Brabantio respects him enough to invite him to his home, where he meets Desdemona. Desdemona is impressed by his eloquent recollections of his wartime experiences, so much that she falls in love with him. Othello is able to captivate his peers with his speeches. The duke’s reply to Othello’s speech about how he wooed Desdemona with his tales of adventure is: “I think this tale would win my daughter too”. Othello's achievement is not so much that he survived his difficult upbringing but that he survived it in such a spectacularly successful manner, ending up one of the most powerful men in the Venetian defence forces. In the final moments of the play, Othello regains his composure and, once again, seduces both his onstage and offstage audiences with his words. Love for Othello puts order, peace, and happiness into his world, which would otherwise lapse back into chaos. Chaos is the old concept of Hell, and Desdemona is the angel who has rescued Othello with her love. Difficult upbringing: he has grown up in exile, slavery, danger, and despair, and even now, as a professional soldier, he lives amongst chaos on the battlefield. He is visibly different due to the color of his skin, so he lives constantly among, but separated from, other people. He doesn’t really fit in. He is constantly referred to as "The Moor," while others go by their personal names. When other characters call him "black," they refer to his face but also to the concept of color symbolism in Elizabethan morality: white is honor, black is wickedness; white is innocence, black is guilt. Roderigo and Iago use racial epithets, such as “the thick-lips”, “an old black ram”, and “a Barbary horse” to describe him. Brabantio is also cruel in that he assumes Othello has used some ‘black magic’ to entrance his daughter. It is Desdemona, as well as Othello, who turns the secret marriage into a social success with her skillfully worded defence. 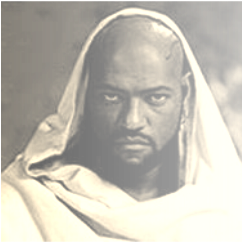 Although Othello is intelligent and confident in military matters, he is an outsider and is socially insecure. He is proud of his success, but this is perhaps only a mask for his insecurities. When faced with the prospect of managing love and marriage, Othello's inexperience undermines his confidence. It is as if he feels that Desdemona’s love for him is too good to be true. Othello sees Cassio as the man most Venetian women in Desdemona's position would like to marry and, therefore, as the man she would turn to if she ceased to love her husband. Othello's insecurities are so close to the surface that a few words from Iago tear the confident exterior and expose his fears, desires, and tendency to violence. Othello cannot stand uncertainty; it drives him to near madness. However, once he makes a decision, he is decisive in action, as befitting a military leader, hence his decision to kill his wife. Fate is cruel to Othello, like the cruel fate of ancient Greek tragedies. In his final speech, Othello brings again a flash of his former greatness: his military glory, his loyalty to Venice, the intensity of his love, and his terrible realisation that, by killing Desdemona, he has destroyed the best in himself. It is the tension between Othello’s victimisation at the hands of a foreign culture and his own willingness to torment himself that makes him a tragic figure rather than simply Iago’s ridiculous puppet. Othello sometimes makes a point of presenting himself as an outsider, whether because he recognises his exotic appeal or because he is self-conscious of and defensive about his difference from other Venetians. Although Othello appears at the beginning of the second scene, we do not hear his name until well into Act I, Scene 3. Othello’s status as an outsider may be the reason he is such easy prey for Iago.